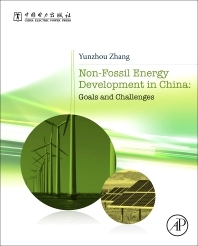 Nonfossil Energy Development in China: Goals and Challenges explores the development of non-fossil energy sources, which is very important for China to protect its energy supply, deal with climate change and adjust its energy structure. At present, the development of energy and electricity is undergoing profound change. The core and most prominent feature is the sudden emergence of clean energy, exerting a decisive influence on the future energy industry. Due to history and resource limitation, a series of problems in the energy development of China have existed for a long time, such as poor energy structure, serious environmental pollution, large carbon emissions, low energy efficiency, regional supply and demand imbalances. The Chinese government has set the development goal for nonfossil energy to 15% in primary energy consumption in 2020. The connotation and interpretation of the goal, possible development scenarios, feasible implementation paths, and corresponding benefit costs are all the major issues this book explains in detail and demonstrates by models. President of the State Grid Energy Research Institute (SGERI). After having the Bachelor degree of Engineering in Power System and Automation in Tianjin University, he did his master degree in the North China Electric Power Institute. With extensive research and project experience in energy and power policy, strategy and planning for more than two decades, he gained many rewards in the field, including the Outstanding Management Consulting Award of SGCC, Scientific and Technological Advancement Award of SGCC, and the China General Chamber of Commerce Science and Technology Award, etc.